Altar flowers are given in memory or honor of someone or some event. They are listed weekly in the church bulletin. There is a yearly calendar in the Red book to sign up for flowers. Flowers are $17.50 Please designate payment check with “flowers”. After the service on Sunday, if you paid for the flowers that week, they are yours to take. Often times they are taken to those who are sick or shut ins. Acolytes will learn the practical steps in the duties of being an acolyte during worship services on Sunday morning and during special services as well. An acolyte should arrive 15 minutes before the service. Have your hair combed, hands and fingernails clean. You should be dressed in a presentable manner. We do not wear robes or vestments at Cheltenham UMC. You should use the restroom if necessary then wait quietly in the Narthex. Review the bulletin to be aware of any changes or special services. The Pastor may have special instructions for you. Now is also a good time to check the candle lighter. Care of the Candle lighter is very important. Not only are they expensive, but they must be in good working order. If the wax wicks are not inserted correctly, they can jam inside the lighter. Check your wick before each service. It should be at least 3 inches long. The church building is the House of God and must be respected with reverence at all times. This includes even those occasions when you are rehearsing or servicing pews as well as during the worship service. So walk, do not run to your appointed tasks when indoors, and boys should always remove hats or caps. Remember…you are in God’s House as an aid to the congregation during those times of public worship. Anything that calls undue attention to “self” in God’s House is out of place. An acolyte must be careful not to distract worshipers. It is not about you, it is about God. tipped slightly forward, with the flame pointing ahead of you and the bell pointing back toward you. Your left hand should be near the bottom and your right hand where it can adjust the knob that regulates the length of the taper. When the first Hymn is sung, begin to go down the aisle together in a dignified, unhurried fashion. 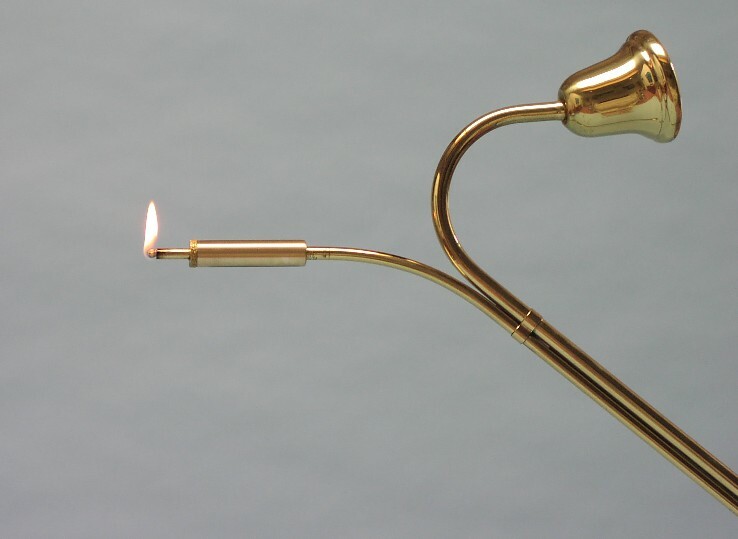 Be prepared to adjust the wick as necessary to keep the flame burning properly. Proceed down the center aisle toward the chancel area. There is an extra lighter in the chancel area just in case your light goes out. If the flame goes out during the procession, You will relight your candle lighter or your candle at the altar if necessary. Always be aware of your partner who is carrying the cross and try to stay together as you proceed. The cross goes first followed by the candle. When you get to the chancel area, stop for a brief moment in front of the cross, then enter through the opening in the chancel railing on the piano side and up the steps to stand in front of the altar. The crucifer will place the cross in the stand on the floor. 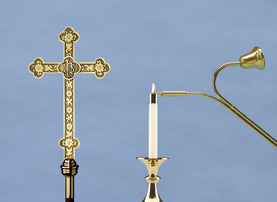 The acolyte will light the candle on the right first (your right) and then the one on the left. As soon as both candles are lit, extinguish the candle lighter. Making sure the candle is lit before extinguishing your candle lighter. Be sure both candles are lit. Extinguish your candle lighter by pulling the wick down and BE SURE to return the wick (up) so the melted wax will not stick inside the candle lighter. Turn and exit the way you came in, taking your candle lighter to your pew with you. Place it on the floor under your seat. Actively participate in the entire worship service, following along in your bulletin. Please do not slouch, sleep, giggle, use electronics or go to the restroom (unless an absolute emergency). Punctuality is important. When you arrive on time, everything flows more smoothly and if there are any problems we have time to fix them without affecting the worship service. Pay Attention . It helps to take a few minutes before the service to check the bulletin for anything special in the worship service. The pastor may need to see you to give special directions. Participate. You will soon find that by being on time and paying attention you will have few problems. Most importantly, don’t forget to worship God. That’s why we are here! When the ushers are called forward, proceed to the alter rail where the Pastor will hand you the offering plates. There is a slip of paper in one of the collection plates. The person counting for that day will write down the number of people in church and return the slip to the offering plate. Take out the slip of paper and hand it to the counter. Once you have approached the altar and received the collection plates, begin passing the plates starting in the front pews of your side and continuing to the back. Proceed slowly because sometime people are not ready and you don’t want them to feel rushed. Music will be played while you are collecting the offering. When you reach the back of the sanctuary, turn and wait for the Doxology to start. As the Doxology is being sung walk slowly down the aisle and go directly to the alter rail. The Pastor will take the plates from you and a prayer will be said over the offering. You will stand at the altar rail until the prayer is finished. Then you may return to your seat. After the benediction there will be a closing hymn. Typically the church only sings the first verse of the hymn. But sometimes they will sing more than one. When the closing hymn begins, you may sing along if there is more than one verse being sung, On the last verse, put down your hymnal and be prepared to move toward the altar. As soon as the congregation begins singing the last verse approach the chancel area with your candle lighter. Stop in front of the candle on the right. RELIGHT YOUR CANDLE LIGHTER AND THEN EXTINGUISH THE CANDLE by turning the candle lighter over and placing the bell over the flame. Then extinguish the candle on the left. The crucifer will remove the cross from its stand (this can be tricky because sometimes it sticks) Letting the cross go first, begin moving up the center aisle toward the back of the sanctuary. As soon as you arrive at the back of the sanctuary, extinguish your candle lighter, put the wick back up, and hang the candle lighter up on the hook over the table on the left side in the of the Narthex. The cross goes in the stand on the right side. Dear God, thank you for being with me as I served as an acolyte today. Help me to remember how important this is to your church. Amen. The acolyte servicing will stop to extinguish the Advent candles. Remember…whatever happens, stay cool, act as if everything is going exactly as you planned it and that we love you and God loves you most of all. When Standing: stand straight and tall with head raised and shoulders back. Standing is a symbol of the resurrection, for it is the posture of the living. When Seated: sit up straight with head raised and both feet flat on the floor. When Walking: walk slowly and erect with head raised. If you are to carry a cross or candle keep each of them straight. If you walk and have nothing to carry, your hands should be clasped together above, never below the waist. -To show my respect for God, my church, my pastor and all the worshippers by my excellent grooming, my promptness and my preparation for my important ministry. -To be an example for all worshippers through my reverent and prayerful attitude and conduct. Thank you for helping us worship God.